Sony STR-DN1060 review | What Hi-Fi? Reliable, easy to get along with and good company, Sony’s £500 amplifiers are starting to feel like old friends. They’ve been strong favourites of ours at this price, winning our Product of the Year Award for the past two years running. That’s not to say the competition isn’t snapping at its heels, but the Sony STR-DN1060 arrives on the back of a five-star review for its impressive cheaper sibling, the DN860. Things certainly look positive, but the pressure is on Sony to keep up the pace. 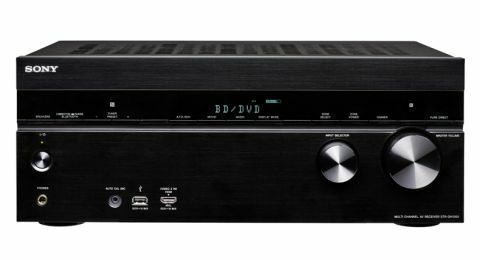 Like the 860, the 1060 has shunned Dolby Atmos – an understandable decision at £400, but one which starts to become more questionable here. But with Atmos discs still few in number, the quality of an amp’s regular surround sound performance has to come first – and the Sony certainly offers plenty of bang for your buck. Load up Fast and the Furious 7 and the 1060 really shows us what it’s capable of. A lot of it feels warmly familiar, with the big, authoritative sound we’ve grown so used to making an assured reappearance here. During car chases, engines rumble with body and depth, and the gunshots fired at Dom’s crew as they pursue the convoy holding Ramsey hostage are delivered with solidity and impact. The Yamaha RX-V679 still takes the Sony when it comes to out-and-out space and weight, but the Sony certainly won’t leave many rooms or setups wanting more. As much as this amp does the big explosions and action scenes, part of the beauty in its presentation lies in its precision and attention to detail. Effects move convincingly around the room, so as cars disappear off screen, you hear them speed past your ears with fluid movement and believability. The glass that shatters during the numerous car crashes seems to land all around you, while explosions and gunfire to the side and behind you are realistic enough to make you look. Detail levels are pretty good too and the 1060’s handling of soundtracks shows real insight. Dynamically we want a touch more from it – occasionally it sounds a little flat where its competitors inject a touch more excitement. But as long as your speakers are up to the job, you can push this amp loud, with no hint of distortion or brightness. By the same token, the 1060 is capable of a great deal of subtlety during quieter moments, with soft soundtracks relayed with an impressive level of nuance and delicacy. If there’s any criticism of the 1060’s balance, it’s that voices could project through the mix with a little more confidence when the scene gets busy. Turn on the Pure Direct mode and things are a little better, but the dialogue on the Yamaha RX-V679 still pips it for overall clarity. When it comes to music, Sony’s tendency to tune its amps in stereo before turning its attentions to multi-room once again shines through, but perhaps not quite as convincingly as last year. There’s no doubt that the Sony offers a seriously refined musical presentation for an AV receiver at this price. It has a great handle on rhythm and timing, and a strong sense of dynamics – something many of its competitors don’t. The trouble is that the treble can become hard to ignore with certain types of music. While this edge helps make for an exciting presentation, it becomes thin and tiring over longer periods, and makes the Sony DN1060 less easy to listen to. It’s far from a deal breaker though. Set-up is a doddle, with the 1060’s chirpy test tones firing quickly around our speakers with verve and vigour. The results are largely accurate, but we turn the subwoofer level down slightly anyway. Sony’s interface is still class-leading in both its design and usability, and thanks to its easy-to-understand menus and equally well-designed remote, it’s a matter of minutes from start to finish before we’re ready to go. Sony’s built-in wi-fi has no problem finding our network, which once connected, unlocks a whole host of other functionality, including AirPlay, DLNA, Spotify Connect and Miracasting. Of course if you’re going to be streaming a lot of high-resolution music, you might want to consider a wired connection for better stability. The 1060 supports FLAC files up to 24-bit/192kHz and 5.6MHz DSD via network and USB, while 24-bit/192kHz WAV files and 2.8MHz DSD are additionally supported over HDMI. Bluetooth is also available, both as a transmitter (for wireless headphones) and a receiver (for streaming music), with NFC on-board for easier, faster pairing. There are six HDMI inputs and two outputs, with one of each being HDCP 2.2 compliant, a copy protection standard that you’ll need to play any 4K content. Just the one input seems a little stingy – we’d like at least one more HDCP 2.2 input to bring it up to speed with its rivals. One input is MHL 3.0 compliant, allowing you to stream 4K video. A second MHL port on the front panel supports Full HD content. Other inputs are covered off by one component video, two composites, four analogue ins, two opticals and one coaxial, while outputs come in at one 6.3mm headphone jack on the front panel, and one each of component, composite and analogue audio. As well as using the included remote, you can control which input you need via Sony’s SongPal app. This comes alongside the ability to play and control music directly from streaming services, change EQ settings, tweak speaker modes and use Sony’s new SongPal Link multi-room functionality. The latter allows the amp to work with other compatible Sony devices to become part of a multi-room system, grouping speakers together where necessary and beaming music across your house using your home network. The STR-DN1060 has plenty going for it, but that isn’t quite as straightforward as before. Those looking to futureproof their system with Atmos won’t find that here, and with the Denon AVR-X2200W showing that it is possible at the same price, things start to get tricky. Atmos aside, there are better sounding amps out there in a standard setup, plus the DN1060’s spec isn’t quite enough to truly futureproof it for 4K either. We have to dock it a star for those reasons alone, but it’s still one for the audition list.